AT&T is pushing back against the US government’s attempt to block it’s acquisition of Time Warner. “This defies logic,” Stephenson said. Here’s a surprise: an old media CEO citing the growing power of new media to try and get his away. 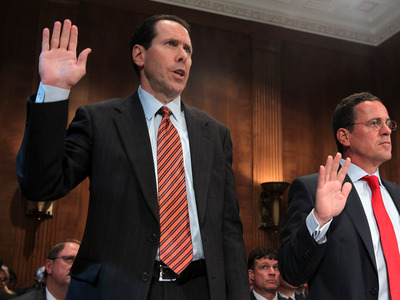 On Monday, AT&T CEO Randall Stephenson responded to the US government’s attempt to block it’s acquisition of Time Warner, citing giants like Amazon, Google, Facebook and Netflix as examples of companies with expanding clout. Essentially, Stephenson’s argument to the US Department of Justice was: you think AT&T buying Time Warner is going to create a monopoly? What planet are you on? Our little $85 billion deal is peanuts compared to the disruptive power of those global juggernauts. Interestingly, there is a precedent for a merger between traditional players citing the competitive power of tech giants to argue its case. And it didn’t work. Last year, Staples and Office Depot called off a potential $6 billion merger, despite arguing that Amazon’s position in selling office supply goods would keep the market competitive.